With deep regret, Manchester City Football Club is sad to announce Neil Young has passed away following a long battle with cancer. One of the most elegant players to ever wear a sky blue shirt, Young was one of the Blues’ greatest players and played an integral role in the club’s glory years during the late sixties and early seventies. Born on February 17 1944, Fallowfield-raised ‘Nelly’, as he was affectionately known, was a lifelong City supporter who fulfilled his boyhood dream by playing for the club he supported. The gifted forward joined the Blues in 1959 as an apprentice after finishing school and within a couple of years he forced his way into the senior side, aged only 17. Young’s first game November 1961 in a 2-1 defeat away at Aston Villa and he remained in the side for the rest of the season. He established himself as a first-team regular, though it wasn’t until the arrival of Joe Mercer and Malcolm Allison that his precocious talent really blossomed. With a cultured left foot and the ability to almost glide round defenders before unleashing unstoppable drives with his thunderbolt shot, Young became the Blues’ main creative influence as the team powered its way to the league title in 1968. With 19 goals from 40 appearances, Young finished top-scorer during the championship season, scoring two crucial strikes in the 4-3 title-clincher at Newcastle on the final day of the campaign. Perhaps Young’s finest moment in a City shirt came in the 24th minute of the 1969 FA Cup final when his goal brought the trophy back to Maine Road for the first time in 13 years. The following season he bagged a double in the European Cup Winners’ Cup semi-final against Schalke, before scoring the opening goal of the ECWC final against Gornik and then winning the penalty that proved to be the winning goals on the night. 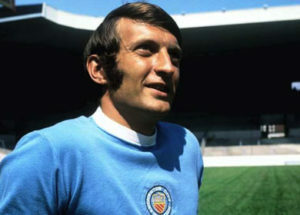 Alongside Francis Lee, Colin Bell, and Mike Summerbee, Young was part of the most formidable attacking force in British football at the time and was seen as equally as important to the club’s success as his three team-mates, particularly by the City faithful. It was odd for such a gifted player to never win the international recognition he deserved and it’s still astonishing that Young never won a single England cap. With first-team opportunities becoming limited, left Maine Road in 1972 after scoring 107 goals for the club in 412 appearances and signed for Preston North End, prior to a brief spell at Rochdale before retiring. Young was inducted into the Manchester City Hall of Fame in 2008 in acknowledgement of his services to the club, an honour that made him immensely proud. Quiet and shy away from the game, he rarely visited the club in his later years, though still followed the Blues’ progress keenly. He will be sadly missed by his wife Carmen, family, friends and everyone connected with the Manchester City. Neil’s daughters Melissa, Nadene and son Mark have all expressed their gratitude at the love and respect the City fans and club has shown. They have personally asked the club to thank everyone for their kindness and messages of support.